Bonfire night can be a stressful time if your pet is scared of fireworks. A PDSA report from 2015 found 39% of pets have a fear of fireworks 1. Although we know the colourful explosions in the sky are perfectly safe, our pets don’t understand. Their heightened sense of hearing also makes fireworks more intense. For dogs, cats and other pets frightened of fireworks, each bang causes a rush of adrenaline and the release of stress hormones. 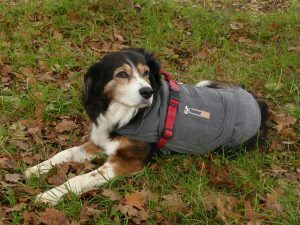 There are lots of ways you can help your pet feel calmer during the firework season. Below are some tips on how to prepare and things you can start doing now. You’ll also find recommended products and tips to help a pet feel at ease when a firework display begins nearby. First up are the signs of stress that your pet may show, indicating fireworks are making them feel anxious. Making firework night as stress-free as possible requires some advanced planning. It’s a good idea to start thinking about your prep before November, especially as some displays often take place the weekend before bonfire night. If you are a new puppy owner or thinking about getting a puppy, their experiences when young can affect them when they grow older. When your puppy is 0-16 weeks (the socialisation phase) they are very responsive to stimuli. Exposing your puppy to unusual sounds, sights, people and other dogs during this period of their life can make a more relaxed adult dog. Microchip your pet – Microchipping your dog is now a legal requirement in the UK but not required for cats. Scared pets can try to escape, so it’s important that if they go missing a microchip is in place to help reunite pet and owner. Desensitise your pet to loud noises and fireworks – Habituation is a type of learning where a response to a stimulus (e.g. stress caused by the sound of fireworks) is reduced through repeated exposure. Playing firework noises on a low volume ahead of bonfire night will reduce your pet’s stress response to that sound. You can buy desensitisation CDs filled firework noises that can be played on a stereo or you can use these amazing free Soundcloud files from Dog’s Trust on your PC. Begin playing these sounds at a low volume and if your pet responds well, you can increase the volume over time. Build a firework den – A firework den is a place that muffles the sound of the fireworks, hides them from sight and makes your pet feel safe. This could be behind the sofa, in a wardrobe or under a table. When you’ve found the perfect spot, add blankets to muffle the sound and hide fireworks from view. Familiar toys and pillows can also make your pet feel more comfortable and safe. Secure the house and garden – Before bonfire night, make sure the home and garden are escape proof! Scared pets are more likely to try and flee. Close and lock windows, gates, doors and flaps. If you have to answer the door, make sure your pet is secure in another room before answering. Take a long walk before nightfall – Before the firework beings, around dusk, take your dog for a long walk to help tire them out. This can help them feel more restful during the evening ahead. Serve your pet a carbohydrate-rich meal – A large meal ahead of the fireworks can make your pet feel more relaxed during the evening. This is due to the body using energy to digest a large meal and a rise in the levels of L-tryptophan – an amino acid that is converted to serotonin, which regulates mood and relaxation. 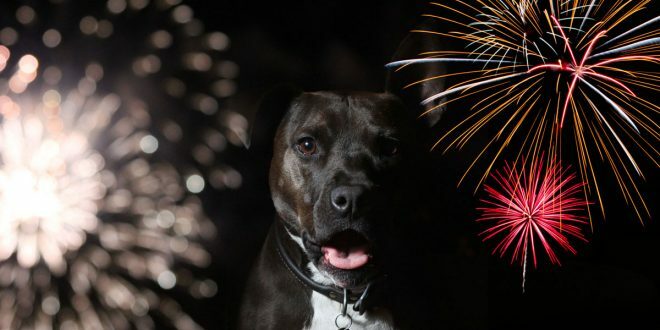 The tips above will give your pet a head start before the fireworks begin, but there are still more options if your pet shows signs of stress once the fireworks start. Close windows and blinds and draw the curtains – If you haven’t already, closing windows and drawing the curtains will minimise the amount of noise and light getting into your house. Don’t lock your pet away in a room however. If they are unable to retreat to somewhere they feel safe, this will make them more stressed. Play background noise – Having the radio or TV on can help mask the sound of the fireworks. The constant noise will also make the firework sounds seem less unexpected. Don’t turn the volume too high in an attempt to completely cover the sound though, as this could damage your pet’s delicate hearing. Keep calm yourself – Don’t allow yourself to become stressed and anxious over your pet’s fear. They will pick up on your mood and this can make them stressed too. Avoid reinforcing your pet’s fear – If your pet wants to be around you when the fireworks start going off, let them do so. Don’t excessively comfort them however, as this can reinforce their fear and justify their scared behaviour. Don’t punish your pet for being afraid – On the flip side, don’t punish your pet for being afraid. This can greatly increase their stress and will not eliminate their fear. Don’t restrain a scared pet – Cats in particular do not like to be restrained when scared. Allow your pet to hide behind the sofa if that is where they feel safer. Hopefully, your firework den will be useful here. Restraining a scared animal is dangerous and can exacerbate their fear. Give toys and treats as a distraction – Their favourite toy or some treats ahead of time can help distract your pet when the fireworks start going off. A filled KONG toy or food puzzle can help keep your pet distracted for longer. Zylkène – Zylkène is available for dogs and cats, it contains a milk protein derivative that induces relaxation in newborns. Give Zylkène 1-2 days before the fireworks begin for the best effect. Calmex – Calmex is another nutraceutical option, available for dogs and cats. It creates a lasting feeling of relaxation for up to 6 hours and is useful for acute situations (like bonfire night). Not recommended for long-term use. Pheromones – Available for dogs (Adaptil – 30 day starter pack) and cats (Feliway – 30 day starter pack), these pheromones are detected by dogs and cats but not humans. Available in diffuser, spray, collar and tablet forms. Dogs and cats produce many pheromones, but the ones found in Adaptil/Feliway decreased stress. Switch a diffuser on a few hours before the fireworks begin for the best results. Other Products – Calming collars are available, although not considered as potent as tablets, sprays or diffusers. Valerian is a herb used to treat anxiety in humans and is also available for pets. Bach Pet Rescue Remedy also receives a lot of reviews although not everyone sees a noticeable difference. In severe cases, dogs or cats with noise phobias will still show signs of stress, even after following these tips. In these cases you will need to speak with your vet about pharmaceutical options. See this in-depth look at how noise phobias can be managed for more information. 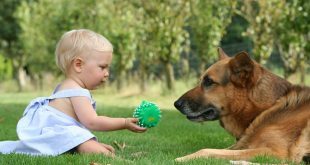 Your vet may refer you to a canine behaviourist who will support your pet. Do you have any tips not listed here for helping your pet feel safe and secure on bonfire night? Have you had success with any of the products listed above? Let us know in the comments section below. 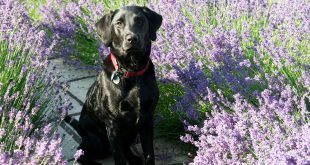 Next Are Essential Oils Safe for Dogs? Thank you for your tips. My dog trembles and hides under my every firework night. I’ll try these tips and hope it works well for him. Thanks for sharing these information. My doggos can not stand fireworks.